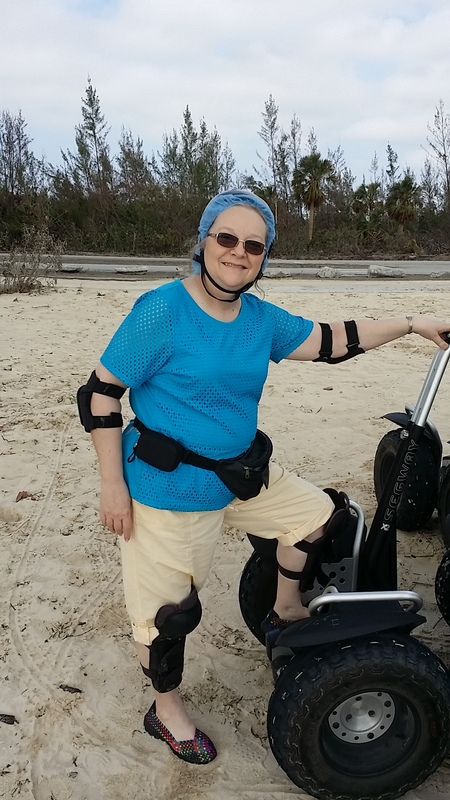 I love Segways—the two-wheel kind—so when Dan put off the booking of excursions during our day in the Bahamas, I found a Segway tour of the beach at Freeport. We’ve ridden the wonderful balancing machines at seaports and tourist attractions and even at home. We feel confident on Segways. So we already knew about the helmets, kneepads, elbow pads and even the blue sanitary head covering they made us put over our hair. We geared up fairly quickly and went to practice riding in the sand. Sand is not pavement, as we quickly discovered. We had bounced down a flight of stairs at Nassau and navigated up and down spiral ramps at Corpus Christi. Everywhere we’ve ridden, some of the paths were not paved. But sand is tricky; it moves. Our guides had warned us repeatedly about the big boulders, about how we should steer clear lest we even touch them with our wheels. They had girded us up with every protective device. They had warned us about traffic driving on the left side of the road. But they had not warned us about shifting sand. So I learned some things. Over confidence will get me hurt every time. Just because something looks stable, does not mean it is. Just because I’ve done a thing before, doesn’t mean I still can. Always do the tricky thing on the last day of vacation…just in case. If I have to fall off a Segway, try to fall backwards—not sideways. Always carry arnica and aspirin in my luggage. Always go dancing on the first night of the cruise…just in case. Always be prepared to laugh at myself just in case I wind up looking silly. But I knew all these things already! I’ve been here before. This is why I pack three zip-close gallon bags with every just-in-case over-the-counter remedy for whatever is going to go wrong. I’ve also learned I would rather laugh at myself crashed in the sand on a beautiful Bahamas beach than sit home and wish I could. I would rather limp around on a bruised foot than relax in a lounge by the pool. Vacation is not what we do to rest; it is how we expand our horizons. Life is an adventure; bumps are a given. This entry was posted in Short Takes on Life and tagged All-terrain Segways, Bahama vacation, expanding horizons, life lessons, shifting sand. Bookmark the permalink. This made me think of our Thanksgiving day this year. I started down our wooden steps which were…slick and my dangerous crocs were slippery on the steps. It was as if someone had grabbed me by the ankles and jerked forward. I had on Tom’s heavy padded coat…As my back hit the edge of the steps I was thankful for all that padding. My left foot somehow went under me and the little toe was hung up on something. I realized in a nano second that if I didn’t pull that foot forward I was going to start tumbling and when I did manage to jerk it out I came to a sudden stop on the wet step sitting there in my pj’s. Both my shoes went flying off and landed on the ground below. I felt as if my left foot had somehow been folded beneath my body. It was discolored there by the toes. When I got inside I immediately started looking for my Arnica gel and it seemed to draw the pain to the surface. Different than any effect I have had from arnica before…I was limping around for an hour or so when I remembered the Trauma Comfrey crème by EuroPharma and I rounded it up; I got instant pain relief when I rubbed it in on top of the arnica…I had a really blue toe at first but by Monday when I saw the podiatrist it was just about normal color. No breaks, just bruises. I’d already had the podiatrist appointment before it happened so that all worked out really good. Turns out the new expensive shoes I’d just bought a couple of months before were too curvy for my feet! I have straight feet. He told me which kind to get and now my feet are much better. Thanks for sharing that! So, you learned a life lesson about wearing the right shoes?